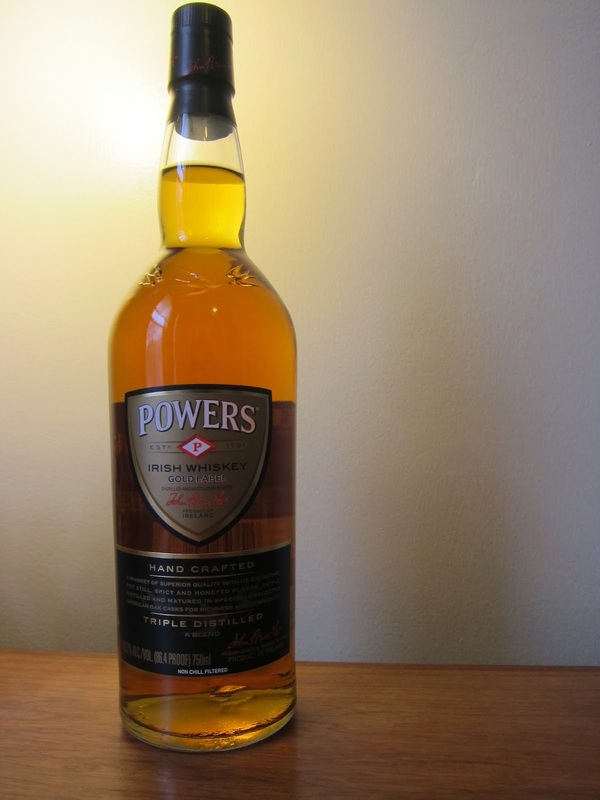 Powers Gold Label (43.2%): Everybody knows that I don't hide how much I like Powers. It's one of my all time go to whiskies since it is very affordable and quite easy to find almost in every bar, it is the irreplaceable key ingredient of Irish coffee and it is without a doubt the best companion to a pint of cold Guinness. Like its better known brother Jameson it is distilled at New Middleton Distillery in County Cork, owned by the same owners Pernod Ricard and again like Jameson it is a blended whiskey containing both pot still and grain whiskey components. But the difference in the ratio of those two type whiskeys in its vat makes Powers a much more enjoyable spirit for my palate. Or at least it used to be... I don't know if anything has changed with the new, a little bit fancier bottle and label design with a slightly elevated price tag and let's see if it can be also a good sipping whiskey in a Glencairn glass. Color: Orange blossom honey and dark gold with some legs on the glass. Nose: Baklava syrup with cinnamon, bunch of crushed cloves, lavender and nutmeg. New leather couch, quince jam and pear compote. There is also a chalky and vegetal layer underneath which is amplified with just a few drops of water: green asparagus, bitter greens and lemongrass. Palate: Grilled banana peppers and charcoal dust. Sweet with wild flower honey notes. Very young cereal grain whiskeys with black pepper and mild spices. Again water elevated the green character of the whiskey: Lemongrass and rocket leaves. Finish: Medium long with black pepper spiciness and alcohol burn. Overall: So, it is young and harsh but it has a style and attitude. I think it noses and tastes slightly younger than the previous versions or just didn't quite hold up in the tasting class like in a shot glass (I bet the latter one is a better assumption). I still like it more than Jameson but I think I will keep it as my favorite dive bar and Irish coffee whiskey and will reach another bottle next time when I want to sip an Irish whiskey at home. Powers is more like your buddy with whom you like to go out bar hopping and have an awesome wasted night but you don't want to invite him home necessarily for a family dinner. It's hard to argue further with its price tag just over $25.00 though.